Guten Morgen Grammar: German Adjective Endings and the Magic Saucepan | Guten Morgen Berlin! April 30, 2015 April 30, 2015 - Guten Morgen Berlin! Guten Morgen Berlin is broadening its horizons, ladies and gents! As well as the usual occasional quaint ramblings about goings on in this fair city, we’ll now also be featuring lessons in German language and grammar on the site for anyone who is looking to improve their German, revise an important topic or simply loves thinking about the intricacies of cases and word order. That third group of people are truly kings among men. My other readers needn’t fear – there will still be plenty of tales of me falling over and showing my knickers in public to keep you happy in between. And as you can see, all these German language posts – under the oh-so-branded title of Guten Morgen Grammar (oh it’s happening, ladies and gentleman) can also be found neatly categorised in a separate page in the top tabs. Check it out! It’s hard for me to come up with a set order that these lessons should come in, particularly since some will cover whole ideas in German, whereas others will be more about specific nuances or details of the language. So I decided to start with a topic which I love, partly because no-one else does, and partly because I used to be one of those people until one long summer, I decided to sit down and figure the whole thing out until I knew it all off by heart. It’s amazing what the pressure of finals will do for your motivation. I feel really sick today. Man, your dad is so stingy! Ich fühle mich total krank. Man eh, dein Vater ist sooo geizig! German adjectives are tricky because they add an extra ending on there when they are coupled with a noun to help show the gender and case of a noun (gender and case will be future lessons too! ), and unlike in French, we’ve got three whole genders to play with and FOUR cases! Our cup runneth over! Take a look at the tables in the image at the beginning of this post. Those are the endings that you jam on the end of the adjectives in different situations. Let’s look at the weak ones first. 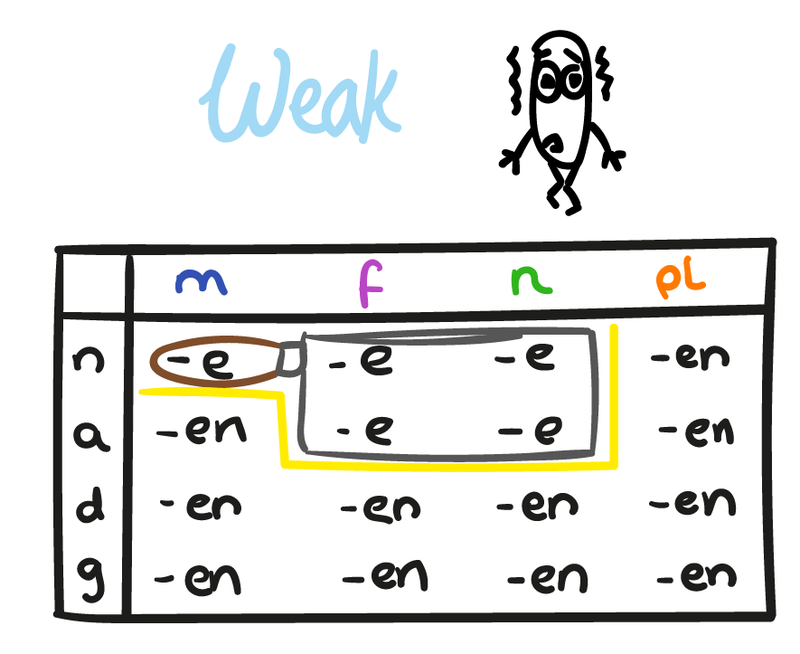 ‘Weak’ adjective endings are the ones which you use on the end of the adjective when you are using the noun with der, die or das – the definite articles. I like to think that they are weak because they are so pathetically uninteresting. This all sounds complicated and boring, but it’s actually dead simple: if you are using a noun, like ‘crisps’ (Chips) and you are using it with the definite article (die Chips) then you just take whichever ending corresponds to the gender of the noun – in this case neuter – and the case the noun is in – let’s say nominative – and shove the ending on there. The cheap crisps are actually the best ones! Die billigen Chips sind eigentlich die Besten! Did you eat the whole bag?! Hast du die ganze Tüte gegessen?! The best thing is how easy it is to remember these endings. You see that table up there? See that shape drawn in yellow? Notice how all the endings inside that shape are just -e, and all the ones outside the shape are -en. Now notice how the shape kind of looks like a saucepan. I’ve drawn it in for you. It’s the magic saucepan. 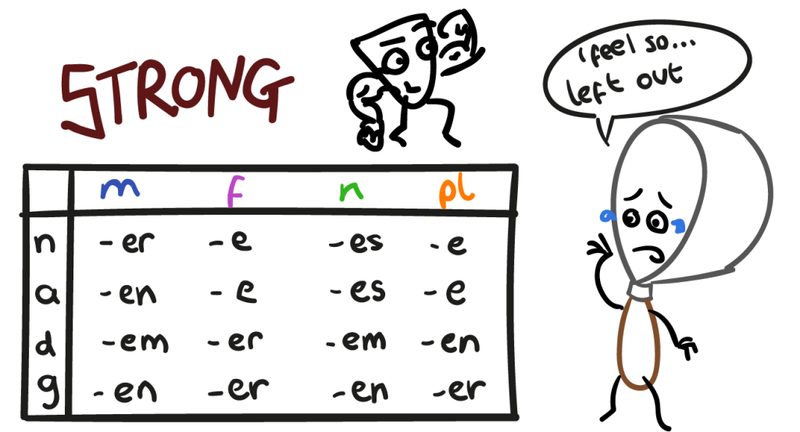 It is my guaranteed trick to remembering your adjective endings. The rule is, if it’s outside of the magic saucepan, it takes -en. Always and forever. The ‘mixed’ endings get a bit more wild. As Mr Potatohead is demonstrating here nicely. ‘Mixed’ endings are the ones we use when we are using the noun in question, let’s say ‘possum’ (Beutelratte) with ein, eine or ein – the indefinite article (eine Beutelratte). Different article, same process: just find the right gender, and the right case – let’s say accusative – and whack that ending on there. I saw a dancing possum in my bedroom!! Ich habe eine tanzende Beutelratte in meinem Schlafzimmer gesehen!! Did you kill it with a heavy book? Hast du sie mit einem schweren Buch getötet? Easy peasy. And look – there’s the magic saucepan again! This time, every adjective ending inside the saucepan is just following the ends of the definite article (der, die, das etc), and as always, everything outside the saucepan is -en. Outside the saucepan, it’s always -en. Inside the saucepan is where the magic happens. Magic Saucepan. Now, the Magic Saucepan is unfortunately not mighty enough to have power over the Strong adjective endings, but there are still some tricks to remembering them without having to memorise that whole table. See the nominative and accusative endings? They follow the endings of ‘der’ exactly, because they are giving the same grammatical info as ‘der’, so that’s easy pease. 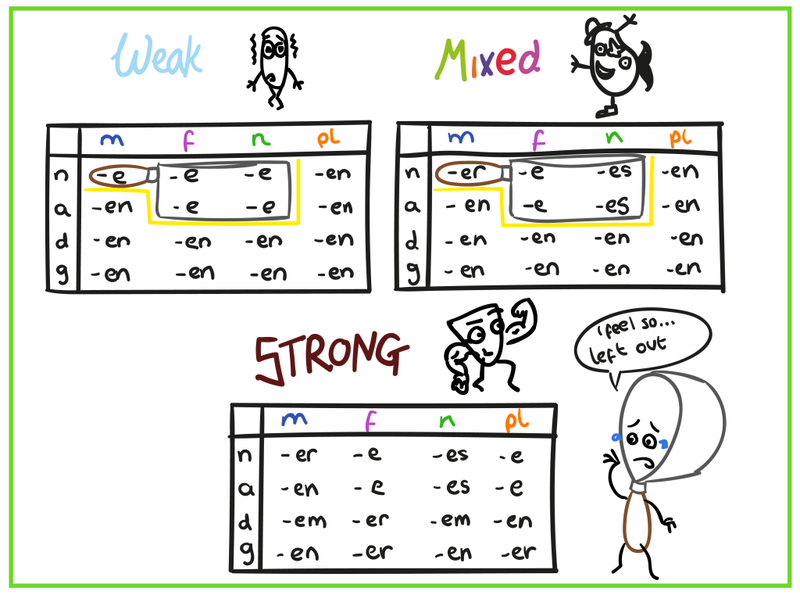 Genitive is easy because there are only two endings, same for masc and neut and same for fem and plural. 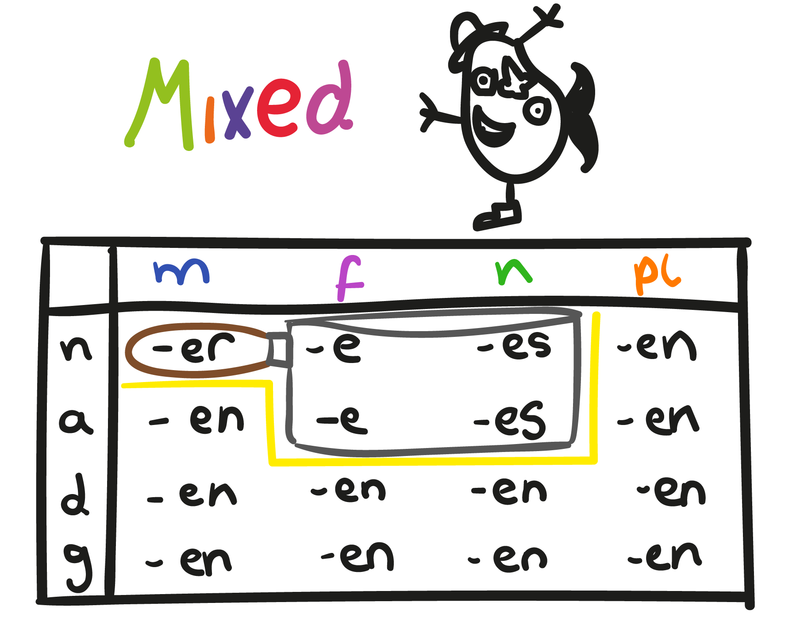 And dative is the best one, because if you put all the endings together you get ‘M R M EN’: MR MEN. Mr Men. Not gonna forget that now, are ya? I bet you all enjoyed that and are raring to practise your strongs, weaks and mixeds (and I just realised how much the adjective endings sound like cocktails…). Well generous as I am, here is an activity to help you practise! Download here. And come back to this page soon for the answers! Hello! Thanks for the fun tables. =) Perhaps someone has already alerted you: the image at the very top of the page has as error in the mixed table. The accusative neuter ending should be -es, not -en.